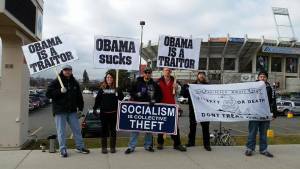 Impeach Obama NOW Protest in Indianapolis, Indiana | Stop Obama Now!! Click photo to go to gallery Mad King Obama will visit Indianapolis, Indiana on Friday to address his worshipful subjects at Ivy Tech Community College. Local patriot groups and even individuals are requested to join in. If you belong to a group in the area, please ask your organizer to support this protest. If any individual would like to help organize this event, use the contact tab above to volunteer. Sometimes we cannot find a group that will help. Individuals can help, also.